The Cohiba Siglo V is an exquisite Cuban cigar, a Lonsdale of medium strength, of 43 ring gauge, 6.7” (170mm) long and comes in a box of 25 cigars. Rated #2 Cigar of the Year 2009 by Cigar Aficionado, it fully deserves this award as it is a perfectly rolled cigar, with a flawless draw and an amazing burn. Powerful flavors are developed by this vitola, which is unique in Cohiba’s lineup, there are lots of cedar, leather, earth, pepper, some sweetness and a constant creaminess. The price is not a deterrent for its many fans, who value this Habano as the best from the Siglo Linea. 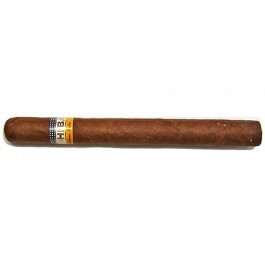 The Cohiba Siglo V is a very rich cigar, full of flavors but never over powerful. •	The delicious flavors of wood, leather, earth, and of sweetness are all tied-in thanks to an amazing smooth creaminess. •	Perfect construction, these are just why Cohiba is the best Habanos. For many, this cigar is simply the best of the Siglo Linea. The wrapper of the Siglo V has a nice Colorado Claro tone, milk chocolate color. The construction is amazing; there are few smooth veins, almost no visible seams and the triple cap is perfectly applied. The wrapper has some grassy, leathery and earthy aromas. The cigar cuts easily, and at cold, the draw is slightly tight, it remains this way throughout, and reveals a classic woody, grassy and earthy notes. There is also some saltiness on the lips. The first draws give some classic Cohiba earth, grass and creamy flavors, along with some fruit acidity, almost like a lemon zest. The burn is perfect, not wavy at all, and doesn’t require any correction. The ash holds on nicely at the foot, and this cigar generates a generous amount of smooth smoke at each puff. The first third of the Cohiba Siglo V starts off with typical Cuban flavors, in addition to straight tobacco, which is delicious there are notes of cedar, of black coffee and still the grassy characteristics, which are common to the other Cohiba from the Siglo line-up. There are also notes of leather, pepper, vanilla and still some citric acidity. There is ample creaminess throughout the first third, and makes it a delicious smoke, with a medium strength. It is never too strong, so that the flavors are not hampered. In the middle third, the flavors evolve slightly, the earth becomes more dominant, the coffee becomes darker, but we also get a bit more spice notes. An acidic sweetness arises, very fruity like, that mixed with some nutty flavors, of pecan and macadamia; it is very reminiscent of flavors you would find in a trail mix. The creaminess is still very present, mixing up nicely with the grassy flavors. Overall, the balance between strength, sweetness, sourness and freshness is amazing, the middle third is really the sweet spot. There are also notes of chocolate and wheat. The cigar is still at a medium body. In the final third, the flavor profile evolves toward a more salty profile, the grass is intense, the earth is richer and stronger, closer to a leather taste. There is almost no more sweetness left, to the exception of some hints of vanilla or sweet lemon sorbet. The chocolate notes are of a dark chocolate, more like a cocoa bean. Overall, the body of the cigar increased slightly and is hovering around a medium – medium to full. In summary, it is an exquisite smoke, always interesting and never too powerful.